Well-drafted and administered benefit programs are effective recruitment and retention tools and enhance employee relations. They help keep your employees happy and productive, which can have a significant impact on your organization’s success. Conversely, problems in this arena can result in significant morale problems and litigation costs. Constangy’s employee benefits team is prepared to guide your company through this highly complex legal area, which is governed primarily by the Internal Revenue Code and the Employee Retirement Income Security Act of 1974 (ERISA). Our attorneys understand the significance of the effective use of client resources in providing benefits as a part of the total compensation scheme. Significant liability can be created by an employer's failure to comply with the fiduciary and regulatory requirements of the law. Even more frightening, individual liability is a risk for officers, directors and managers with responsibility over employee benefit plans and policies. To minimize this risk, we often assist companies with all aspects of their compensation and benefit plans and programs, from design and implementation to bringing new employees on board, and helping assure a smooth exit after a termination. Our experience allows us to advise employers and others regarding all types of retirement and deferred compensation plans; health and other welfare benefit plans; fringe benefit programs; and executive compensation agreements. We work with employers, plans providers and insurers, giving us a thorough knowledge of the world of benefit administration. Our specialized practice group assists clients in implementing and administering any qualified retirement plan (e.g., 401(k), pension plan, profit sharing plan, employee stock ownership program), executive compensation program, welfare plan (e.g., health, life, disability, severance), or fringe benefit plan (e.g., educational assistance plan, cafeteria plan). We also assist in compliance reviews to avoid expensive corrections and penalties resulting from audits by the IRS or Department of Labor. We routinely advise clients regarding voluntary correction programs and corrections on audit with the IRS and Department of Labor. We also conduct training seminars and advise clients regarding compliance with the Affordable Care Act, HIPAA and COBRA. Our employee benefit plan advice covers all aspects of benefit plan establishment, administration, and compliance. Counseled numerous clients regarding obligations under Internal Revenue Code Section 409A deferred compensation plan rules. Counseled companies (including publicly traded, closely held, tax-exempt and governmental employers) regarding retirement plans, executive compensation programs, and fringe and welfare benefit issues with a specific focus on the issues specific to the compliance, recruiting and retention issues facing each company. Advised regarding restructuring a retirement program to better match client’s recruiting and retention goals, including freezing of benefits under company’s defined benefit pension plan and enhancing defined contribution plan. Assisted clients through merger and divestiture processes, including preparing and implementing new benefit plans for resulting companies for all types of benefit programs. Assisted clients in many different industries (including governmental entities) in evaluating requirements of the Affordable Care Act and options for compliance. Assisted clients with managing withdrawal liability. Our ERISA knowledge, combined with our litigation and trial experience, provides our ERISA Litigation practice with nationwide impact. 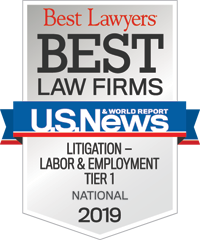 This dynamic and ever-evolving practice group is comprised of lawyers possessing experience in a wide variety of litigation and administrative proceedings involving employee benefit plans. We regularly represent employers as plan sponsors and plan administrators in both routine and complex employee benefits litigation. In addition to litigating employee benefits matters, we counsel large and small companies and fiduciaries both in anticipation of litigation regarding employee benefits issues and in dealing with regulatory agencies. Our litigation capabilities are enhanced by our firm’s broad experience with retirement and welfare benefit plans, administrative service contracts, and plan administration. Due to our strong labor relations practice, we hold significant experience in negotiating benefits claims (including plant closure benefits), controversies regarding multi-employer plan issues and contributions, and litigation and NLRB charges relating to benefits. We have successfully defended equal employment claims, including claims of benefits discrimination under the ADA and ADEA. The following types of matters handled by members of our ERISA Litigation group demonstrate our depth of experience and the complexity and range of issues that we litigate. These are critical factors in selecting counsel for benefits litigation and for advice in litigation-sensitive matters.